A wide variety of lodging and other tourist services may be found in the area, with Sedona being the center of activities. Many people are charmed by Sedona's paradoxical nature. While nestled in a rugged canyon and surrounded by national forests and wilderness areas, the town offers a wide area of modest to upscale lodging, upscale shopping, and cultural attractions. Lodging ranges from cottages and cabins, to bed and breakfasts, motels, and up to the finest upscale resorts. Condominium rentals and timeshares are also available. The area also boasts many fine restaurants. There are many National Forest Service campgrounds available as well as a smaller number of RV parks. 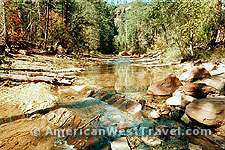 See our section on camping in Sedona, Oak Creek Canyon, Verde Valley, & Prescott. There are three visitor centers providing information on area activities. They are located in the Village of Oak Creek south of Sedona, the Chamber of Commerce in downtown Sedona, and at the north end of Oak Creek Canyon. Red Rock Passes are sold at these locations. The passes entitle you to park in national forest areas around Sedona and Oak Creek Canyon. Sedona Oak Creek Chamber of Commerce. In uptown Sedona near junction of AZ-179 and AZ-89a. Address is 331 Forest Rd., Sedona, AZ 86336. North Gateway Visitor Center. At the north end of Oak Creek Canyon, on AZ-89a near Flagstaff. Located in the Oak Creek Vista (the overlook at the top of the switch-backs entering the canyon). The Best Western Inn of Sedona is an award-winning hotel nestled in Sedona's red rocks offering breathtaking views of the natural rock formations. 110 Guest Rooms on one-three floors (no elevator). Heated Outdoor Pool and Hot Tub, Exercise Room, Complimentary continental breakfast. The Best Western Arroyo Roble Hotel & Creekside Villas is conveniently located in the heart of Sedona, Arizona with magnificent red rock views and close to jeep tours, Sedona Jazz on the Rocks and numerous art galleries. A variety of beautiful golf courses can be found close to the hotel. 65 Guest Rooms on five floors. Heated Outdoor & Indoor Pools and Hot Tubs, Steam room, Exercise facility, Complimentary continental breakfast. The Comfort Inn hotel is perfectly situated in the heart of the magnificent red rocks of Sedona. Guests may stroll to Sedona's best art galleries and boutique shops. 52 units, 2 floors, no elevator. Heated outdoor pool, hot tub, fitness/activity center, free full breakfast. Located on 11 landscaped acres with gardens, decks, and private lawns, L'Auberge de Sedona offers views of the Red Rock vistas. L'Auberge Restaurant on Oak Creek serves French-inspired American cuisine and offers indoor and outdoor seating with views of the Red Rocks and Oak Creek. The Spa at L'Auberge features massages in an outdoor cabana along Oak Creek. 56 guest rooms and cottages, 1-2 floors (no elevator). Heated outdoor pool, hot tub, spa. This Mission-style Villa Was Built To Maximize The Views Of The Red Rock Formations. Canyon Villa B&B Inn Of Sedona Features A Heated Pool, Landscaped Gardens, Outdoor Fireplace And Poolside Patio With Lounge Chairs, And Tables And Chairs With Market Umbrellas. Full, Complimentary Gourmet Breakfasts, Featuring Homemade Cinnamon Rolls Or Muffins, Are Served Each Morning In The Formal Dining Room. Complimentary Soft Drinks And Juices Are Available 24 Hours A Day. Hors D'oeuvres And Beverages Are Served In The Early Evening. Coffee, Various Teas And Homemade Cookies Are Provided Each Evening. 11 guest rooms on 2 floors (no elevator). Outdoor heated pool, full breakfast, two night minimum stay-weekends. 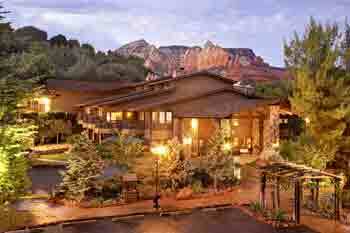 More Hotels in Sedona, Arizona. Sedona Chamber of Commerce - Where to Eat. Restaurant guide. Outstanding, upscale fare can be found at Cucina Rustica (Mediterranean), Rene at Tlaquepaque (American and Continental), L'Auberge Restaurant on Oak Creek (premiere dining, reservations a week in advance. More modest and tasty fare at Blue Moon Cafe (pizza, burgers), and El Rincon at Tlaquepaque (inexpensive Mexican). Stay Smart at the Flagstaff Holiday Inn Express. This hotel is centrally located to many Flagstaff and northern Arizona attractions, such as Grand Canyon, Sedona, and Oak Creek Canyon. 154 units on 5 floors. Heated indoor/outdoor pool, whirlpool, exercise room, free expanded continental breakfast. More Hotels in Flagstaff, Arizona Area. The Best Western Prescottonian is ideally situated in the center of Prescott with easy access for day trips to the beautiful red rocks of Sedona and breathtaking views of the Grand Canyon. Hotel guests will appreciate the nearby attractions including famous Whiskey Row and Smoki Museum. 121 Guest Rooms on two-three floors (no elevator). Heated Outdoor Pool and Hot Tub, Complimentary hot buffet breakfast. The Award Winning Holiday Inn Express Hotel of Prescott, just 96 miles north of Phoenix, is conveniently located near the entrance to Prescott's Gateway Mall, and only four miles from the historic Courthouse Plaza and Whiskey Row. 76 units, all with refrigerators and microwaves, on 3 floors. Non-smoking hotel, Internet, free Expanded Continental Breakfast, heated indoor pool, sauna, whirlpool, exercise room. More Hotels in Prescott, Arizona. Prescott Chamber of Commerce. Restaurants. A short distance to the Red Rocks of Sedona, Best Western Cottonwood Inn is in the heart of the Verde Valley and conveniently located near many attractions. 78 Guest Rooms on one-two floors (no elevator). Heated Outdoor Pool and Hot Tub, Exercise Room, Complimentary continental breakfast features Homemade Belgium Waffles. More Hotels in Cottonwood, Arizona. Cottonwood Chamber of Commerce. Restaurants. Camp Verde Chamber of Commerce. Lodging. Jerome Chamber of Commerce. Lodging (offers good detail). Jerome Chamber of Commerce. Dining. This book is the bible for Sedona hikers, the one that knowledgeable people recommend. It contains detailed descriptions and maps that guide the reader to 135 day hikes around the Sedona area. Arizona's Mogollon Rim runs roughly east-west across the north central part of the state. The top of the rim offers cool and wooded places. Thousands of feet below you will find fascinating canyons which eventually gives way to the Sonoran Desert. The following pages offer a sampling of Rim Country. Interstate 40 runs roughly parallel to the Rim across the state and provides access to all areas. From Phoenix, access is by I-17 or State Highway 87. Highway US-89a runs through Oak Creek Canyon 20 miles south of Flagstaff, Arizona.